Simple Calendar is designed to do one thing really really well: render a calendar. It lets you render a calendar of any size. Maybe you want a day view, a 4 day agenda, a week view, a month view, or a 6 week calendar. You can do all of that with the new gem, just give it a range of dates to render. It doesn't depend on any ORM so you're free to use it with ActiveRecord, Mongoid, any other ORM, or pure Ruby objects. Thanks to all contributors for your wonderful help! Generating calendars is extremely simple with simple_calendar. The first parameter is a symbol that looks up the current date in params. If no date is found, it will use the current date. In these examples, we're using :start_date which is the default. You can generate a calendar for the month with the month_calendar method. You can generate a week calendar with the week_calendar method. Setting number_of_weeks is optional and defaults to 1. You can generate calendars of any length by passing in the number of days you want to render. Setting number_of_days is optional and defaults to 4. What's a calendar without events in it? There are two simple steps for creating calendars with events. The first step is to add the following to your model. We'll be using a model called Meeting, but you can add this to any model or Ruby object. By default it uses start_time as the attribute name. In your controller, query for these meetings and store them in an instance variable. Normally you'll want to search for the ones that only show up inside the calendar view (for example, you may only want to grab the events for the current month). We'll just load up all the meetings for this example. Then in your view, you can pass in the events option to render. The meetings will automatically be filtered out by day for you. If you pass in objects that don't respond to the attribute method (like starts_at), then all the meetings will be yielded each day. This lets you do custom filtering however you want. There are a handful of configuration options that you can use in simple_calendar. This will generate a folder in app/views called simple_calendar that you edit to your heart's desire. Setting Time.zone will make sure the calendar start days are correctly computed in the right timezone. You can set this globally in your application.rb file or if you have a User model with a time_zone attribute, you can set it on every request by using a before_filter like the following example. This code example uses Devise's current_user and user_signed_in? methods to retrieve the user's timezone and set it for the duration of the request. Make sure to change the :user_signed_in? and current_user methods if you are using some other method of authentication. Setting classes on the table and elements are pretty easy. You can simply run the following command to install the calendar views and then add your own helpers to the table, rows, headers, and days. Just paste this into a CSS file and add your styles and they will be applied to the calendar. All of these classes are inside of the simple-calendar class so you can scope your own classes with similar names. Header and title links are easily adjusted by generating views and modifying them inside your application. Rendering calendars that update with AJAX is pretty simple. You'll need to wrap your calendar in a div, overwrite the next_link and previous_link options, and setup your controller to respond to JS requests. The response can simply replace the HTML of the div with the newly rendered calendar. 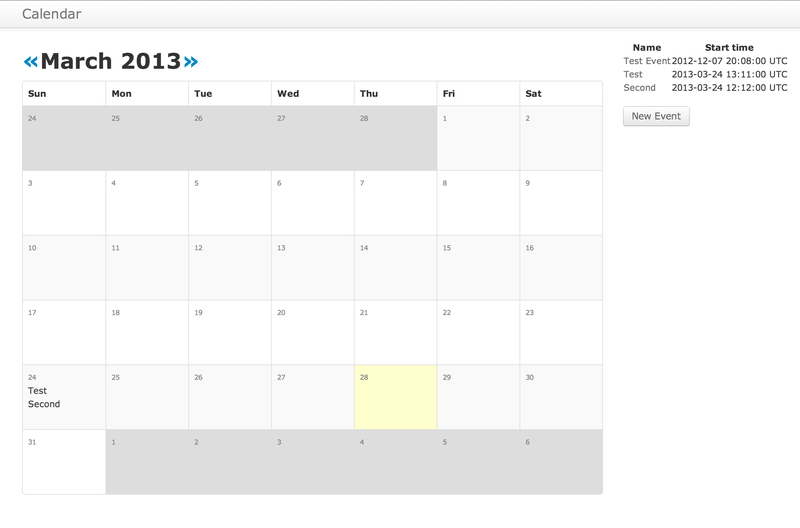 Take a look at excid3/simple_calendar-ajax-example to see how it is done. The three main calendars available should take care of most of your needs, but simple_calendar makes it easy to create completely custom calendars (like maybe you only want business weeks). If you'd like to make a completely custom calendar, you can create a new class that inherits from SimpleCalendar::Calendar. The name you give it will correspond to the name of the template it will try to render. The main method you'll need to implement is the date_range so that your calendar can have a custom length. And this will render the app/views/simple_calendar/_business_week_calendar.html.erb partial. You can copy one of the existing templates to use for the partial for your new calendar.